"Leave the suffering to artists. Designers should be happy"
On 30th March, Ben Christie from Magpie Studio gave an incredibly enjoyable and insightful talk on what makes the Magpie Studio team happy, and therefore a whole lot more creative. Ben began by explaining that one of the reasons why himself, WEDF’s very-own Jamie Ellul and David Azurdia came together to start Magpie Studio in the first place (apart from it being a drunken decision at the pub) was to increase their wellbeing and give themselves a better work-life balance. Years on, this goal still drives Magpie, with the additional consideration of family-life and fatherhood. Ben explained how after having children, his family became the main driving force in his life. His ultimate goal is to find the balance between family-life and being an ambitious business owner and designer. How can he sustain his thirst for creativity whilst having a family? One of the solutions to help achieve this happy balance was the introduction of a 4-day working week at the studio. Not having to compromise on either work or family is a work in progress, but they are getting there. From the very beginning, their go-to design references have always been the bibles that are A Smile in The Mind and the D&AD annuals. Today, they have managed to stay true to these initial sources of inspiration by having their own work featured in the re-release edition of A Smile in The Mind and also being owners of numerous D&AD pencils. Ben talked about having learnt to take control of situations and has found that being organised and implementing structure within the business has been more liberating than it has been restricting. The more time and therefore headspace you can free up, the more creativity is allowed to happen. However, this free time is only found by working hard to get it – yes Magpie work a 4-day week, but the working days are exactly that. Employ people that you would like to have a drink with (and obviously good designers). Magpie know how to have fun (with things like the 4 o’clock question time, annual team holidays, lunch together every Friday and a very cheeky quote book) but they know when to buckle down and work hard. Even though their numbers have increased, there is still a sense of closeness and family, which seems to be the key when it comes to having a happy, creative studio. ​‘The real driving force behind Magpie studio are the people’. Ben described their initial apprehension of growing bigger when they started as a small agency, but over time they’ve realised that bulking up has allowed them to take on the bigger projects with a more skilled team. The more you talk and build happy relationships with your clients, the more trust you build… then you can get away with anything! Magpie always look for ways to increase efficiency within the studio, from a quality point of view as well as a financial one. They have introduced display boards to get ideas (and people) off computers and in to conversations, as well as exercises like challenging themselves to fit an idea onto a single post it note – the ultimate stress test of a good idea. Work that they thought would go down well with a client when trying to get a smile sometimes hit the wrong cord as it wasn’t the right time or place. Plan your humour wisely! 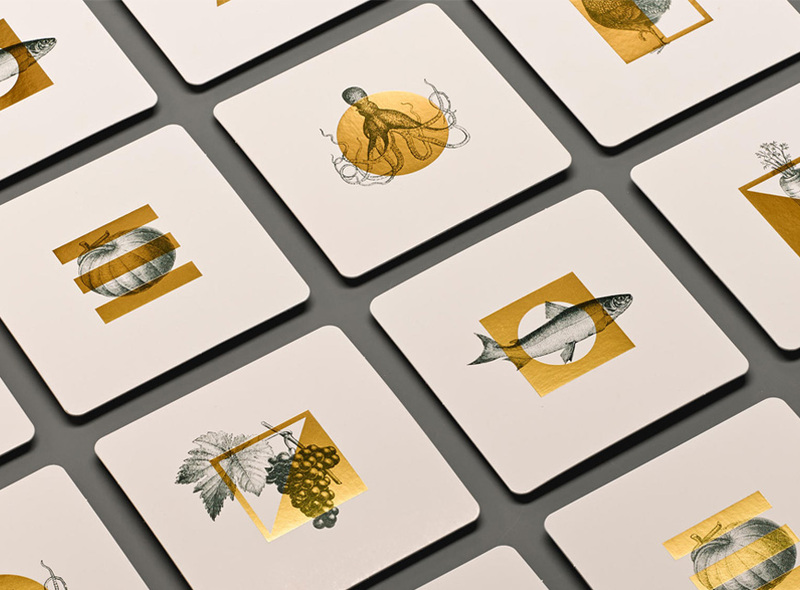 Ben treated us to some recent projects including their branding for ​‘Dandelyan’ – a cocktail bar on the Southbank – which showed their ability to produce work with a simple, clever and clear narrative. Branding for ​‘The Thinking Traveller’ showed off their flair for creating covetable pieces of design and print, as well as beautiful copy, another strong skill that runs throughout Magpie’s work. ​‘Copywriting is a big thing for us’, they often use a single, considered and well thought-out copy line as the starting point, then the whole idea grows from there. The identity they produced for ​‘London’s Brewing’ – a small craft beer festival in London fields – showed their talent for producing witty ideas, well executed, and wouldn’t be out of place in A Smile in the Mind. The campaign they created for British Heart Foundation’s ​‘Happy healthy mealtimes’ is also worth a look. A ​‘No Holds Barred Magpie Q&A’ session followed with answers varying from studio mantras of ​‘the best new business is old business!’ to lessons learnt along the way; including the importance of making the story of an idea as visible to clients as possible. Ben talked about the nightmare of losing employees when they move on, yet enjoying the invigorating effect new employees can bring to the studio. The rarity of senior designers within the industry was discussed as well as the changing landscape of permanent roles versus the popularity of freelance. The importance of taking studio members to presentations was brought up – the fact that the insight and value it can give a designer out of the studio far outweighs the cost of taking time out of the working day. Ben concluded that the future drive for Magpie is to ​‘stay happy and stay creative’. In an industry that can get clogged down with the daily grind and struggles, we have to remember that we are very lucky to enjoy going to work everyday. We work in a creative, inspirational and playful field, and that is a very happy thing indeed.